- a guarantee of a minimum wage for the lowest tariff wage for non-pedagogical employees workers. The strike is joined by 73 percent of elementary schools, 70 percent of high schools and over 5 percent of the institutions in higher education. Besides the OZ PŠaV, also the New Education Union (NŠO) joins the strike. NŠO is a new union which claimed to have over 300 members this August. It was formed after the OZ PŠaV refused to call a strike last year and unites the previously unorganized education workers and those who left OZ PŠaV. From the beginning there are cases of schools which are threatened not to join the strike and these threats continue in the next days as well. Four hour negotiations between the union officials, several ministers and the Prime Minister Robert Fico reach no conclusion. The government proposes ideas for a memorandum dealing with future improvements in the education sector, plus the 5 percent wage increase into tariff wages for pedagogical workers. The union puts the strike on hold from 28th November 6:00 PM, reasoning that the government started to negotiate the day before. The union says it is going to take time until 5th December to decide whether it signs a memorandum or not and then they may continue the strike again. The Prime Minister says that if the union prolongs the decision even the 5 percent wage rise could be withdrawn. are shocked, return to the staff room and decide to continue the strike. A statement is written and spread to mass media calling all the schools to continue the strike. The rest of the striking schools (still over 50 percent) in Slovakia stop the strike (with the exception of GLS). NŠO calls the move of OZ PŠaV a betrayal, but stops the strike as well, later recommending their branches to debate about further steps. GLS is on strike and the workers become a key point for other schools willing to continue the strike. A meeting with representatives from five other Bratislava schools takes place at the GLS premises. A demonstration is called for Friday. A demonstration is attended by 2000-3000 mostly pupils. People march from the Government Office to the parliament. A meeting of representatives from 17 Bratislava schools follows at GLS. A form of “relay race strike” is adopted with a schedule of schools willing to strike next week. GLS workers stop the strike because of financial reasons, but remain a key point for the other schools, sharing their experience and providing support. Two Bratislava schools are on strike as part of the relay race strike. Four Bratislava schools express their protest in various forms (a concert and cultural/ sports program; a petition of pupils denying they were forced to protest by the teachers as claimed by the Prime Minister; a refusal to go to school; a half hour protest in front of the school). Protest actions are organized by pupils in Trenčín and Banská Bystrica as well. A board is placed opposite the Ministry of education with the count of days already on strike. Three schools are on strike in Bratislava and two in Trenčín. Education union of the ZSP (IWA/AIT Poland) protests at the Slovak embassy and the Slovak Institute in Warsaw in solidarity with the striking workers. Four schools are on strike in Bratislava. One asked the parents not to send kids to school the day before – out of 586 only 55 pupils show up on Wednesday. A demonstration with the same route as on Friday is organized in Bratislava. Approximately 600-700 people come, this time many more education workers than on Friday. In Levice a protest meeting at the city square is held. The union refuses the government proposal saying protest will continue next week from Tuesday to Friday as relay race demonstrations in all the major cities, and will flow from the East to the West. No strikes are planned by the union because of the coming Christmas and because they “do not wish to traumatize the society”. However, the Confederation of Trade Unions (KOZ) federating most unions in Slovakia (and having an election agreement with the ruling party SMER-Social Democracy) makes an unprecedented statement in the recent union history in Slovakia – the Executive Board recommends the officials of OZ PŠaV to accept the government’s offer. Two schools are on strike in Bratislava. 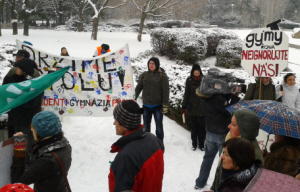 “Saint Nicolas” strike, a protest action at the premises of another secondary grammar school in Bratislava, is held with a cultural program and discussions. One school in Bratislava and one in Púchov is on strike. OZ PŠaV makes a statement that no negotiations are planned from their side but the protest actions are going to take place anyway. During the last two weeks Priama akcia has been engaged in the events in several ways. We published almost a dozen articles in the newly created [ŠTRAJK BLOG] on our website. We created an online e-form in Slovak and English, so that people can protest the OZ PŠaV officials’ decision of putting the strike on hold. We have called for actions in front of Slovak institutions abroad and are very thankful to ZSP for an action in Warsaw. We consider such solidarity actions extremely important in the next few days! Besides that, we have supported the workers via leaflets distributed at the demonstrations, in which we thank them for the actions they’ve done and support them in the hard times they face as organizers who had to sacrifice a lot of time, resources and even health to keep the strike going on. The strike has still not been called off by OZ PŠaV although only symbolic demonstrations are planned. Next week, some schools are still willing to join the relay race strike. It is hard to say now what happens after the week of protests announced by the OZ PŠaV or after Christmas. The workers have ideas of what could be done but receiving ideas or at least simple solidarity messages from education workers abroad would be more then welcome. Solidarity with the self-organizing education workers in Slovakia!